During Leak Week UK 2018, we published brand new guidance on sensible precautions to take after an epidural blood patch. 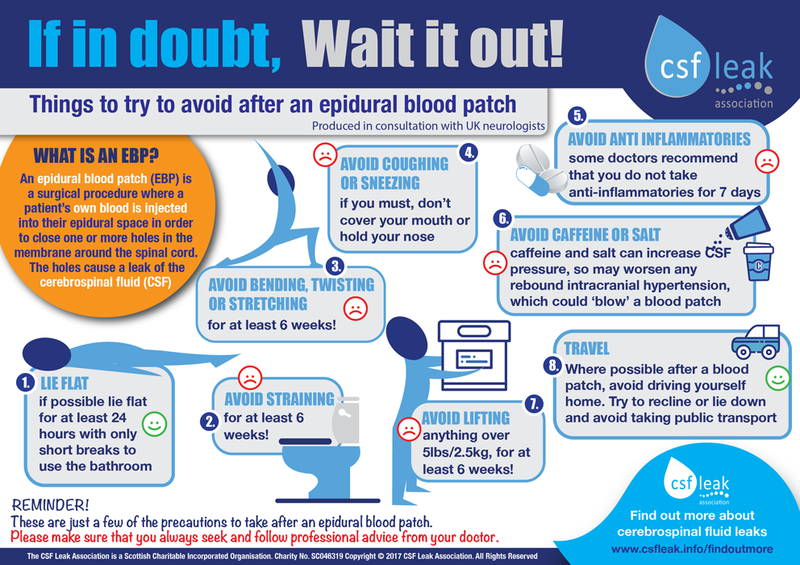 It covers a range of key considerations for things to avoid or consider if you’ve recently had an epidural blood patch to resolve a spinal CSF leak. Whilst this guidance has been produced in consultation with UK neurologists, as always, we would strongly encourage you to seek and follow advice from your own doctor. You can download your copy of the leaflet by clicking here. 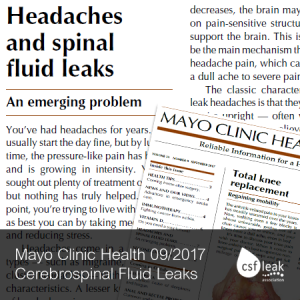 The Mayo Clinic has published an interesting overview of CSF leaks in its September 2017 edition of the Mayo Clinic Health Letter, entitled ‘Headaches and Spinal Fluid Leaks – An Emerging Problem’. “You’ve had headaches for years. You usually start the day fine, but by lunchtime, the pressure-like pain has begun and is growing in intensity. You’ve sought out plenty of treatment options, but nothing has truly helped. At this point, you’re trying to live with the pain as best you can by taking medications and reducing stress. Headaches come in a variety of types — such as migraine, tension or cluster headaches — with a variety of characteristics. A lesser known cause of headache pain occurs with low levels of cerebrospinal fluid — a fluid that surrounds, cushions and protects the brain and spinal cord. Low fluid levels can be caused by a temporary leak that occurs when the membrane holding the fluid (dura) is punctured, such as after a lumbar puncture, during surgery or with an epidural injection to numb part of the body. Our latest CSFleak.info factsheet comprises an example of a medical report for CT Myelography and epidural blood patch carried out at Duke University Hospital by Dr Linda Leithe-Gray. The patient is a UK national who travelled to the United States for investigatory procedures not commonly available on the NHS , yet shown through research to return a comparably high level of success in locating the site of CSF leak in comparison to Radionuclide Cisternography and conventional MRI. It is hoped that this report, which outlines the specific procedures used regularly and successfully at Duke University Hospital, may inform and support doctors in their diagnosis and treatment of CSF Leaks in the UK. Our thanks and gratitude goes to the patient for allowing us to publish this information for the benefit of others. You can download the factsheet by clicking here. We’re pleased to announce the publication our third CSFleak.info factsheet – Quick Reference Guide to CSF Leak Terminology – which can be downloaded via our downloads section or by clicking on the button below. Our factsheets provide easy access to key facts and information; they are printable and can be taken with you when you meet with your GP. They are provided in good faith and following careful research, however they cannot be guaranteed error-free and are not a substitute for professional healthcare advice. Before becoming poorly in Dec 2009, I was a happily married, fit and healthy 43 year old with 2 teenage daughters. I collapsed one day for no reason and had not been right since. I would blank out and collapse in a headache attack after being upright too long, resulting in many visits to A&E. After suffering for nearly four years and almost every test you can imagine showing nothing, last July 2013 we decided that enough was enough and to take the bull by the horns and do something once and for all. Final decision. It turned out that was the best decision we had made. I had been diagnosed with POTs in 2012 but felt it was not quite the right diagnosis for the sort of symptoms I was feeling. I had not got the tachycardia or dizziness many people with POTs have and my heart rate only just increased to the POTs threshold of 30 beats per minute when I stood up. I did have low blood pressure and had spent most of 2010 lying flat, which could have prompted the POTs like symptoms. I also had a daily headache, but mine was ongoing – 24 hours a day, every day. It was lessened in the morning but gradually got worse as the day progressed. Every day I spasmed or jerked if I was upright too long or did too much. I would have to sleep every day for an hour at lunchtime in a completely flat position just to be able to continue with anything in the afternoon. If I did not, my head pain would simply increase till I had to lie down and spasm or jerk in pain. He was very interested in my symptoms and sent me for a series of tests – some of which I’d had before. All came back negative for a CSF leak. I would tell anyone who thinks they are leaking to persevere with doctors, as, if they can’t see a leak, they will say you haven’t got one, even if it is a slow leak and not likely to be seen. I did my research. I read Dr. Schievink’s Question and Answers and highlighted anything that referred to myself. I even went on a POTs medication trial for a fortnight whilst in hospital to see if that would help. Once we had exhausted all the doctors’ ideas, including many of the anti-seizure medications, (all of which made my symptoms worse). In February 2014, I lifted a heavy weight and carried it some distance, feeling that something had gone wrong as the pressure in my head suddenly grew. I went home and 36 hours later I could not get up at all without severe pain. It took 2 days to get hold of anyone who would help me and I was prescribed phyllocontin as it is a form of theophylline that increases csf. I was up again in 36 hours, but after taking the medication for 3 weeks and got gradually worse and worse until I was having repeated painful non-epileptic seizures – as in 8-11 in a row. I ended up in hospital where they did not know what to do with me. I was seizing at first 3-5 times a day, reducing to three times a day later on. Every day was the same and it was awful. I persuaded the UK doctors to try a scan that I hadn’t had after emailing Dr Linda Gray in North Carolina, USA. I had already had contact with her as I had asked for a quote to see how much money I needed to raise in order to get a second opinion. I asked her what she would do for me that the UK doctors may be able to do. She said she would scan me and look for any potential leak sites. The scanner she uses is a DSM scanner and my hospital had not got one, but as it is a fairly newly built hospital building, they had the latest MRI scanners up to 3 tesla. Many MRI scanners are 1 – 2 tesla so I knew this scanner would be as good as a DSM scanner (hopefully). The test she recommended was a fat saturated MRI myelogram, using intrathecal gadolinium. My neurologist immediately said it must be done and went to organise it. And this is where it gets tricky. It was proposing to use gadolinium off license and so had to go through 3 weeks of protocol and paper work. I was desperate for help. Eventually the test came. The way it was organised was to do 3 MRIs, one before the gadolinium was introduced and two after. Each MRI lasted 70 minutes. We split it up so the first one was done on one day and the next two on the next day, as it was a long time to stay absolutely still. This was completed Friday afternoon about 6pm. I would be lying if I said it was not hard work. To stay still in the noisy MRI for that long is difficult, but I knew I must do it if I wanted any chance of any leaks to be found. The next day I was told the test showed nothing. I was surprised as it was the morning and I was trying to work out who had looked at them in so much detail to ascertain that information in such a short space of time. So, the next step for me was to get a copy of the scans, to get a second opinion. Again, this isn’t easy. You have to apply to the ministries department at our hospital and pay £50 for your written records and scans. As an inpatient, the scans were not allowed to be released. I had to fight for this by asking the Chief Executive of the hospital to intervene, as my neurologist was more than happy to get the second opinion from the States. This took a while but they did arrive. I have a friend who was able to take the discs and link them as a hyperlink to his Drop box account. This enabled me to simply email Dr Gray in USA with the link and password. I was the go between for my neurologist and Dr Gray for many days. At first she couldn’t open them, then she could. Then she sent the email that made me take a huge sigh – she could see potential leak sites and could name some of them. She wanted to see the most recent scan too as she couldn’t open them. This took a while with instructions and print screen images of how to find what she wanted. She advised my neurologist to do a full volume patch at the cervico-lumbar and then mid-thoracic region. When I discussed this with my radiologist, he said the areas were too wide for him to think I could get any gain. I asked Dr Gray for yet more information. I offered to pay for her services all along, yet she would not accept anything. She replied with a comment of doing the same as before but adding a lumbar region patch too, as the UK would probably not be able to do CT fluoroscopic targeted blood patches at any diverticula that could be a problem and that she would look at me when I could get over there. My radiologist took my scans home for the weekend and then on Monday, he gave me the choice. Three large blood patches or many targeted ones – he said that they could do that but with blood, not fibrin glue. The latter would be more painful and take longer. I decided to go for the targeted ones, as that is what Dr Gray would do in the USA. It was not an easy procedure. I was asked if I would be able to lie absolutely still for it. As it was in the morning I felt confident I wouldn’t seizure as any seizure activity had started developing in the afternoon. After the lumbar puncture and injection of dye, I was asked to roll 15 times lengthways on the bed to mix the dye with the csf fluid. This is easier said than done. After that I lay on my front on the CT scanner and was asked not to move at all whilst being scanned and whilst the needles and then blood was inserted. This is really important. If you move, the blood patches will not go to the targeted areas and will be useless. I had numerous needles put all down my back, from my shoulder blades to my lower back. Most of these were in pairs but some were single. The needles were inserted after an initial local anaesthetic on each one. My radiologist was meticulous to keep them in the exact right place. Sometimes a nerve was touched or tickled, but I still was not allowed to move. When all the needles were in place, the blood was syringed out of my arm and into the needles, about 5cc at a time. A lot of that ran out and down my sides! Some of the inserted blood was quite painful. After each needle was filled, they were all removed and it was over. I lay head down in a gentle tilt for 2-3 hours before I sat up and ate my tea, feeling much better. I did not spasm, jerk or seizure from that moment onwards. I am now at home, at the moment, 2 weeks in and symptom free. Totally. I’m no longer noise, light and smell hypersensitive. I can stay upright all day if I want to and can drive. I feel free and released. I know I’m not healed yet and so need to take it easy. I am planning to see Dr Gray in North Carolina as my neurologist thinks it would be a good idea to get a second opinion and maybe fibrin glue patching. I’m planning to go out in about a month’s time. New Factsheet – What is a CSF Leak? We’re pleased to announce the publication of the first in a series of CSFleak.info factsheets – What is a CSF Leak? – which can be downloaded via our downloads section or by clicking on the button below. CSF Leak Association Factsheet - What is a Cerebrospinal Fluid (CSF) Leak? CSF Leak Association News Blood Patch, cranial leak, CSF Leak, Epidural Blood Patch, Intracranial Hypotension, Spine Fluid, spontaneous intracranial hypotension, What is a CSF Leak? Spontaneous cerebrospinal fluid (CSF) leaks typically present with orthostatic headaches. Less commonly, spontaneous CSF leaks can present with other headache types. Nausea, vomiting, hearing disturbances, diplopia, back pain, and dizziness are not uncommon associated symptoms. Although the exact cause of CSF leaks often remains uncertain, some patients may be predisposed due to disorders of connective tissue or spinal meningeal anomalies. When a spontaneous CSF leak is suspected, head MRI with contrast is ordinarily the first study to obtain. Common abnormalities seen include diffuse dural enhancement, subdural fluid collections, engorged cerebral venous sinuses, and cerebral descent. Important to know is the fact that despite typical clinical features, head MRI may occasionally be unremarkable. In such situations, ancillary studies may help answer whether a CSF leak is present. Radioisotope cisternography and spine MRI are helpful tools in such occurrences. Presently, CT-myelography remains the most reliable test to find the exact spinal CSF leak site. Often, however, the exact CSF leak site is not found. GENEROUS Stone pupils and the family of a teacher suffering a debilitating brain condition have launched a major fund-raising campaign to pay for treatment abroad. Former marathon runner Claire Hubbard, 47, who lives in Eccleshall, used to work at St Michael’s First School in Stone. Her identical twin sister Louise Walmsley is also a teacher at St Michael’s. But four years ago the mum-of-two began suffering excruciating headaches and collapsed on the floor.She spent much of 2010 having to lie down and was in and out of hospital having tests to find the cause of her pain. As a result she began suffering with Postural Ortho Static Tachycardia Syndrome, which causes fainting and light-headedness. She has struggled to stand up without her body jerking or suffering a seizure. DESPERATELY-ILL Claire Hubbard’s family have launched a fund-raising appeal to help pay for a life-changing operation in the U.S. – to stop her brain from ‘sinking’. The 47-year-old’s condition has baffled doctors in this country and her only hope is to meet with experts overseas. Now she needs to raise £13,000 to cover the cost of a specialist brain scan and treatment.